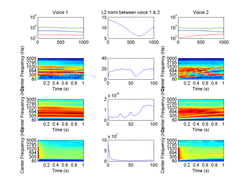 ﻿Takes audio and makes a movie of modulation amplitude and phase in each cochlear channel as it changes over time. Neat patterns arise in music which may be useful for production or sound engineering. See the version below with biologically-plausible modulation filters. ﻿Takes audio and makes a movie of modulation amplitude in each cochlear channel as it changes over time. Neat patterns arise in music which may be useful for production or sound engineering. The temporal modulation spectrum is obtained with log-spaced asymmetric cosine filters with Q = 1.2, and computed over several windows from 1s to 0.25s (weighted toward the present).